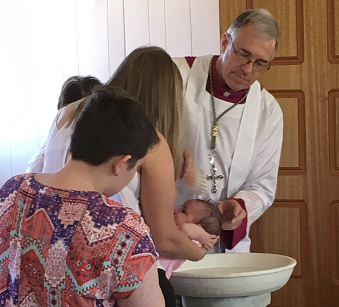 Baptism is a sacrament by which the recipient is solemnly admitted to membership of Christ’s Church. The essential matter of the sacrament is that water is poured three times on the forehead of the recipient. The pouring of the water symbolises both the washing away of sin and the downpouring of power from the Trinity on high. The font is usually placed near the entrance of the church to show that by baptism we gain admission to the church of God. Confirmation is, literally, the making of the person firm or strong in the life in Christ begun at baptism. It has the two-fold effect of strengthening the soul and giving it greater power to express itself through the body. The candidate pledges to endeavour to set aside the smaller life of personal interests and to work for the common good. The Sacrament of Confirmation is one of seven Sacraments of the Catholic tradition. It is one of the seven rituals by which the power and blessing of the Trinity is invoked and directed into the hearts and minds of those who receive them.